1916 Dairy Products and Dairy Cattle Judging Team. National Contest. Springfield, MA. 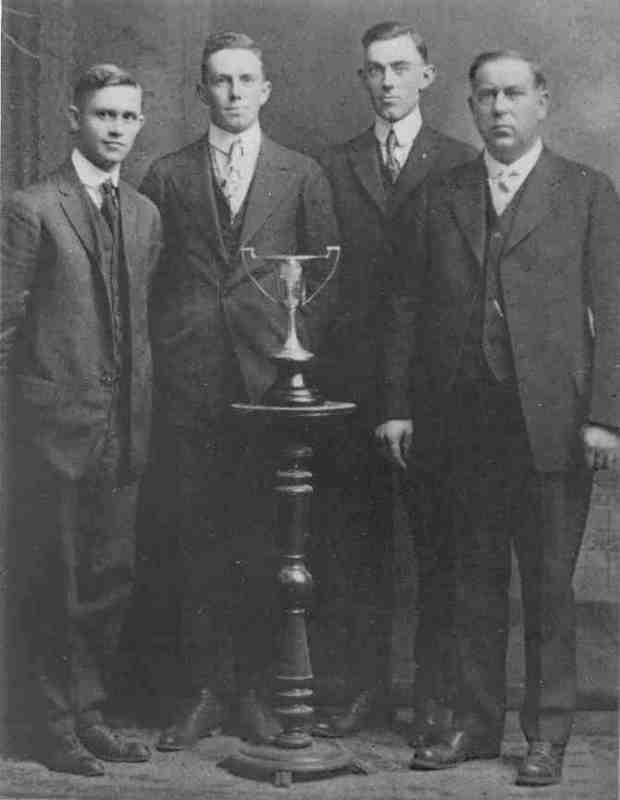 Left to right: Horace Jones, Joe Hill, Ernest Ainsworth, Coach Christian Larson. The Dairy Science department has strong dairy cattle and dairy products judging programs as a part of the curriculum. The department also has a long history of participating in the dairy cattle and dairy products evaluation contests. Dairy Science students competed in the very first contest in Springfield, Massachusetts in 1916 and have since competed in almost every national contests in both cattle and products. Over the years they have won 17 National Championships (1919, 66, 68, 69, 74, 76, 78, 79, 83, 89, 91, 96, 98, 2002, 2005, 2008, 2009, 2010, and 2011) and numerous regional contests. Dairy cattle judging is taught through the Dairy Cattle Evaluation course, DS 212, and Dairy products judging through the Dairy Products Judging course, DS 202. All Dairy Science students are required to take the DS 202 and Dairy Production students are required to take DS 212. Qualified students may compete in regional and national contests. The purpose of dairy cattle judging is to develop decision making and communication skills, while visiting some of our best Midwest dairy farms. Teams for competing consist of 6 students and practice from mid-August to early October. The students compete in at least two contests each fall, including at the World Dairy Expo in Madison, WI. In 2003 the dairy science students were introduced to a new evaluation contest, called the Dairy Challenge contest. At this contest students are presented detailed information about a working dairy, including production and farm-management data. They are expected to conduct a thorough analysis and present recommendations to a panel of judges. This contest provides an excellent opportunity to apply theoretical dairy science knowledge in a practical manner.